Black grapes, sometimes known as Concord or slipskin grapes, are sold fresh or made into jams, jellies, wines, and fresh, bottled and frozen concentrated juices. Black grapes are rich in a number of nutrients, including natural antioxidants known as polyphenols, and can be part of a healthy calorie-reduction diet, which can help you to lose weight. Fresh black grapes are low in calories, with a 1-cup serving containing only 62 calories and about 0.5 gram of total fat. You can eat the grapes whole and raw, but you can easily make a fresh juice from them at home by removing the stems and leaves from 1 cup of grapes, rinsing them, blending them with about 1/2 cup of fresh water and straining the juice into a container. This will give you about 1 cup of fresh juice that's lower in calories than a commercially produced grape juice — even if it's unsweetened. One cup of commercial grape juice has about 160 calories per serving and zero grams of total fat. Substituting whole grapes or fresh grape juice for a 12-ounce can of grape soda once a week can reduce your caloric intake by about 11,400 calories, or roughly 3.3 pounds of body weight, in the space of one year. A good source of dietary fiber, black grapes add bulk to your diet, helping you to feel fuller and eat less. Dietary fiber can also help to reduce the symptoms of constipation as well as lower your blood cholesterol levels. A one-cup serving of black grapes has 0.8 gram of dietary fiber, a high amount for the small serving size. This provides 2 to 3 percent of the recommended dietary intake and can help you meet the daily recommendation, which is significant as many Americans don't get enough fiber from their diets. Black grapes are naturally sweet, with almost 15 grams of sugar per cup. The American Heart Association recommends that you choose natural sugars, such as those found in grapes, over added sugars because natural sugars have a greater nutritive impact. Because of their natural sweetness, you can use grapes as a healthy way to satisfy a sweet tooth or sugar craving. In addition to eating them fresh, you can also freeze grapes and eat them as a refreshing, low-calorie, sweet dessert, substituting them for other foods, such as ice cream or cake, that are often high in added sugar. ChooseMyPlate.gov recommends eating between 1 1/2 and 2 cups of fruit each day as part of a balanced diet, which is important for healthy weight loss. 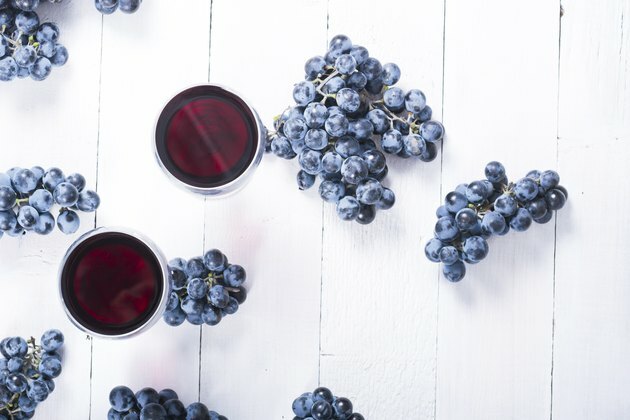 In addition, black grape skins and some grape-based products, such as red wine, are a rich source of resveratrol, a substance that may help to protect against obesity and reduce the risk of heart disease.